KINSHASA, Congo -- Ukraine is going to supply the Democratic Republic of Congo with 20 T72 assault tanks, 100 lorries and thousands of arms and ammunitions, according to a document sent to the United Nations. 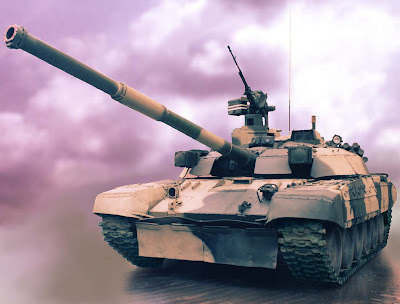 Ukrainian made T72 assault tank. Apart from the battle tanks and transport trucks, the DR Congo will receive 10,000 rounds of ammunition for the tanks, 60 anti-aircraft guns, 10,000 Kalashnikov assault rifles and several hundred thousand rounds of ammunition of various types, said the document seen by AFP on Tuesday. The document, dated January 20, was delivered to the UN Security Council by the Ukrainian permanent mission to the UN in line with a practice that all supplies of weaponry to the DR Congo should be notified to the United Nations, which has a large peacekeeping mission in the country. According to the document, the weapons were due to arrive at the DR Congo's sole Atlantic port of Matadi on March 6. Asked Tuesday about this delivery by AFP, neither the Kinshasa government spokesman nor Congolese defence ministry sources wished to make any comment. Diplomatic sources in Kinshasa said that the arms deal was worth about 80 million dollars (58 million euros). The DR Congolese Armed Forces (FARDC) total about 140,000 men, including former rebels recently taken into the ranks, and is short of equipment, means and training. Currently waging offensives against rebels and armed groups in the east of the country, the FARDC benefits from logistical support provided by the UN Mission in DR Congo (MONUC). Kinshasa has asked the United Nations to undertake the total withdrawal of its 19,000 peacekeeping troops, police and other staff by the middle of next year.